In our Module 1 coursebook you were exposed to statistics reported from the National Survey on Drug Use and Health (NSDUH; SAMHSA, 2016). We are going to return to that survey to examine evidence about the population distribution (epidemiology) of “past year” substance use disorders in the United States. 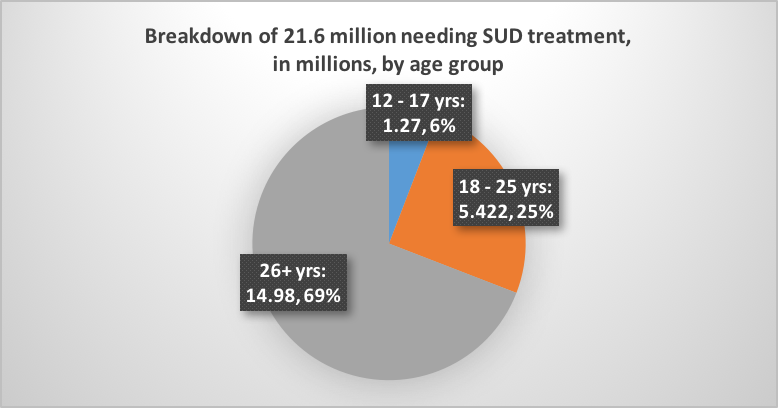 First, we can look at how many people aged 12 years or older met the criteria for a substance use disorder in 2015: about 20.8 million people (7.8% of the population). Second, we can look at which substances were involved in these disorders. By far, the majority involved alcohol (see Figure 2 and Figure 3), either alone or in combination with other substances. A third question that data can help us answer concerns the gap between who needs substance use treatment and who actually is able to receive treatment. According to the NSDUH 2015 survey, 21.7 million persons in the U.S., aged 12 or older, experienced a past year need for substance use treatment. This represents about 8% of the population (or, about 1 in 12 persons). Figure 4 shows how this number was distributed by age group. The good news: about 2.35 million individuals received specialized substance use treatment. The sad news: that means about 19.35 million did not, either because they could not (a disparity gap) or because they did not wish to. A significant goal in social work and other professions is to reduce the gap between the need for services and access to services for all members of society. You might be interested to learn more about this “close the gap” issue in terms of health care in general, and alcohol misuse, by visiting the American Academy of Social Work and Social Welfare (AASWSW) website discussing the 12 Grand Challenges for Social Work (http://aaswsw.org/grand-challenges-initiative/12-challenges/). Ch. 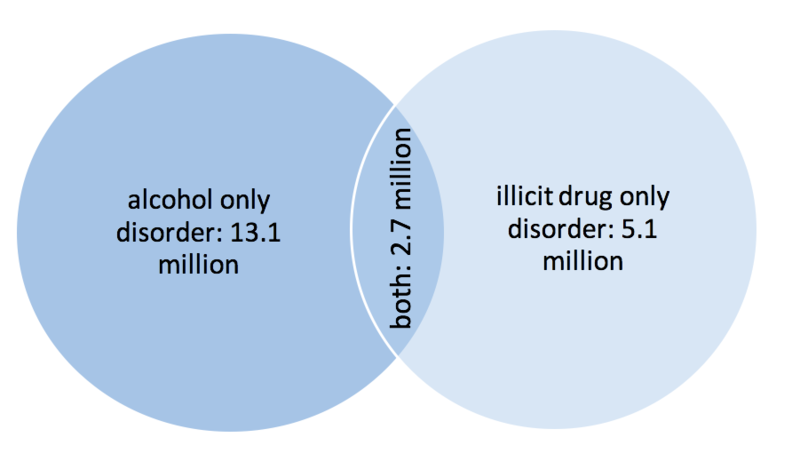 3: Epidemiology of Substance Use Disorders by Audrey Begun is licensed under a Creative Commons Attribution-NonCommercial-NoDerivatives 4.0 International License, except where otherwise noted.